A No-Slip Headband is absolutely ESSENTIAL, and it will save your tichel-wearing life! Two of the most common complaints that we hear from women (who haven’t heard about or used a No-Slip Headband yet!) is that their headscarves slip and their hair often gets pulled out when they try securing their scarves using bobby pins/clips. Enter the No-Slip Headband! Available with a velcro closure or in a slip-on No Velcro version, and multiple sizes and colors, there’s a perfect fit for everyone. Seriously, you need one of these (or two, or three…)! See full description below for sizing information and wrapping tips! 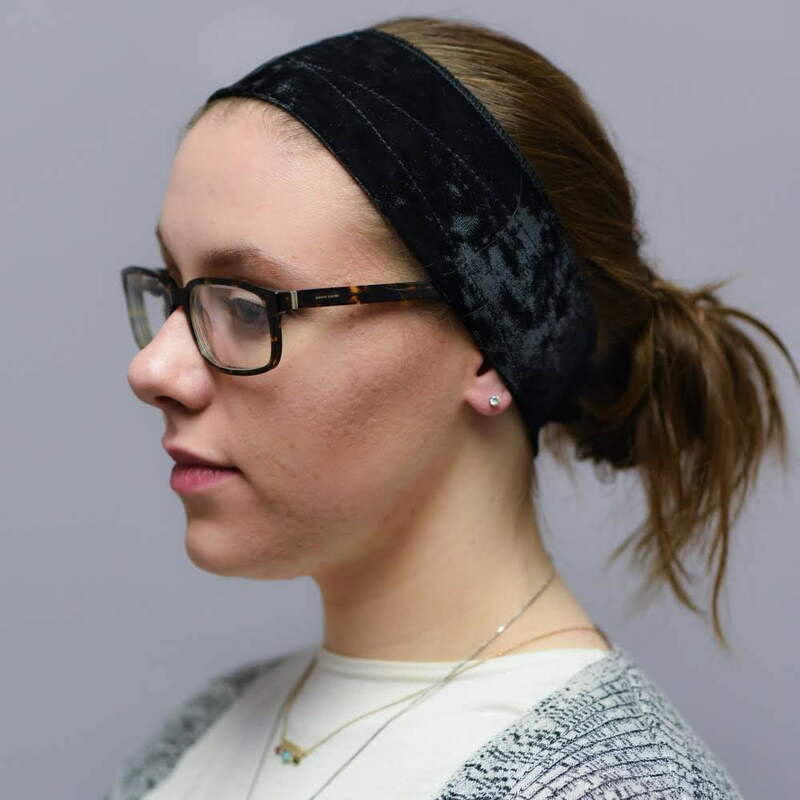 A No-Slip Headband is absolutely ESSENTIAL, and it will save your tichel-wearing life! Two of the most common complaints that we hear from women (who haven’t heard about or used a No-Slip Headband yet!) is that their headscarves slip and their hair often gets pulled out when they try securing their scarves using bobby pins/clips. Enter the No-Slip Headband! Seriously, you need one of these (or two, or three…)! Andrea is eternally grateful for the friend that shared this secret with her years back. It has changed her tichel-wearing life and the lives of countless others! In order to determine which size No-Slip Headband will fit your head, you will want to use measuring tape (or something similar) to measure your head exactly where you want your scarf to lay (i.e. if you want some bangs showing, measure behind your bangs). For a normal fit, you’ll want to subtract one inch or so from your measurement because the headbands are stretchy. If you want a snug fit, subtract a bit more. How snug you want your headband to be will depend on your personal comfort. Some ladies like to wear it tighter, and others like it looser! Often your desired size doesn’t have much to do with your head circumference, instead it’s about your hairline! For example, someone with a low hairline (front and back) will probably need a larger headband. We offer these headbands in 4 sizes. They are adjustable within the measurements listed. Once you have received your life-changing no-slip headband, make sure that you are wearing it correctly! When placed on your head, the friction of the velvet should be felt when you sweep your hand away from your face. If it’s not facing the right way, it will not work! If the band feels a bit tight at first, you can stretch it out by getting it a little damp and pulling on it. Like any knitwear, your headband will probably stretch out a little over a few months of daily wear. To get your headband back to its original size, just wash it by hand and throw it in the dryer (if yours has velcro, make sure to close the velcro or use a bag so that none of your other garments get snagged!). Similarly, if you find the effectiveness of the velcro starting to lessen, give your No-Slip Headband a wash by hand. Check out this tutorial to see Andrea demonstrate all the features of our No-Slip Headband and to hear all her tips and tricks! Love! Love! Wish I had one of these years ago as I have been wrapping most of my life. No slip and my scarves actually stay. Yeah! It’s a bit warm to have on for the summer months, but to have a silk scarf not budge worth a little warmth. Will purchase another one as a back up. This is miles better than any of the various underscarves and caps I’ve used before. It gives a nice neat line under scarves, and does not shift. I have several pretty Turkish silk scarves that were given to me that were always needing at least a couple of adjustments or rewrapping through the day…and even those don’t budge with this as underpinning. Best thing, hands down, for under scarves. I am new to wrapping and am doing it while my hair grows out from a super short cut due to illness. LOVE your scarves and undergarments. My only reason for not giving the no slip headband a 5th star is that I would love to see the velcro just a bit wider. I find that the ends where the two overlap tend to curl at the corners. Usually when I just use the headband alone my sash covers any unevenness but with a smoother scarf sometimes it shows. I have not washed it yet, but suspect that will make it worse. All that said, it is not stopping me from ordering a second one in blonde. LOL! Thank you for the great products, service, and videos! This is what I’ve been waiting for my whole married life. IT IS PERFECT! And I’m finally not slipping into the women’s room several times each day to retie! Great wig/scarf grip, one of the most comfortable that I own. It also does it’s job and keeps your wig or scarf in place. I have a large head with a lot of hair and the size L-XL fit perfectly. I was so afraid to order it just in case it won’t work out for me. Because I’m ordering from Malaysia, I didn’t want to have to pay for shipping twice (or three times) if I loved it. I read all the reviews, and upon finding them mostly positive, I took a leap of faith and ordered 3 (white, black and blonde). Let me just tell you, I wish I had ordered more. Now I don’t feel secure wearing my scarves without one. I showed it to my sister and my friends and let them try mine and they loved it and want to get some for themselves (or sneakily try to steal mine). I just told my doctor about it and she asked me to send her the link so she can buy for herself. I can be your Malaysian Distributor. ? New to wrapping and I love all of your products, especially this! It is so comfortable to wear and such great quality; no fear of slipping. Thank you! So glad I decided to get my velvet headband! Total game changer!! Now my coverings don’t move and they feel so secure! Definitely recommend! If your on the fence about it, get It! SO happy I did because it has made all the difference in covering! I got this in blond to wear with half-wraps (sashes wrapped so my hair shows in the back), as a counter-balance to a shaper which is only suitable for full-wraps. I put it on by fastening the Velcro around my neck, and then bringing it up over my face to my hairline. It fits my head pretty well. The reason I didn’t give it five stars is because it rubs against my ears uncomfortably, and my half-wraps tend to slip back and show the headband some unless I double-knot them, which can cause pressure headaches. I will say, my scarves slip FAR less than before I had the headband, and I no longer have to sit there tucking tons of fly-away hairs into place every 5 minutes and retrying the scarf every hour and a half. I’m glad for the purchase! 🙂 Make sure you get your measurements right and place the headband so the velvet is “growing” towards your face. This is an essential for hair covering, which is not something I say often, not even the shapers. Without this slippage is inevitable. On the downside, these don’t last forever, and will start to slip after a few months. They do have to be replaced every so often. That being said, this with the combination of the classic shaper is the most economic option for “undergarments,” as only the headband would have to be replaced. The velvet headband is one of those “must haves” in my opinion. I originally ordered an XL, because I went by the measurements listed, but found that while it fits and I still use it, an L would have been the better option for me. There’s plenty of stretch to these. But most importantly, it does what it says it will. It keeps your scarf right where it’s supposed to be. Be mindful of the velcro, it can snag scarves, but if you’re careful in putting it on, it’s not a problem. Having the velvet headband is great for days where I’m wearing my classic shaper or no shaper at all! My rating is not based on the quality of the no-slip headband. It feels really nice quality. My rating is based on how it fits MY particular head–others may find it works wonderfully for them. I put it on exactly as the video of Andrea shows it to be put on. I do find the velcro can catch on my oh-so-fine hair, and pulls hairs out when I am trying to take it off. It doesn’t otherwise pull my hair so much I have to take it off–but I know that my hairs find their way into it. I find it just slips back–not as quickly as a tichel or scarf slips without it. It could be the shape of my head–although I don’t think it is particularly flatter, rounder, larger or smaller than any other average head. I do have a high forehead and no bangs, so that could easily be the issue. I put the headband on lower on my forehead, but it still slips back eventually. I have tried just starting it up on my hair, but then it slips back faster–ha ha. I do think this is a great idea–it just isn’t a great idea for me. I ordered one a couple of years ago, and ended up gifting it to somebody online who couldn’t afford one at the time and I wasn’t using mine. I recently ordered again, thinking I needed to work with it more, but it isn’t working well. Hi Heidi! Thanks so much for the honest and detailed review! If you’re willing to email us at wrapunzelthestore@gmail.com we’d be happy to try and brainstorm to see if we can come up with any suggestions that will help the band work better for you! I have two of the white and black velvet headbands, and know that I eventually would like to get the blonde one as well. Why do I have more than one? As many people have said, these headbands are wonderful at keeping your scarf from slipping, and I want to make sure to always have one to wear! 1. The velcro. I worry about the velcro catching on my scarves (especially viscose ones). I also don’t like that the velcro will sometimes “catch” my hair, or bother the back of my neck if I’m not very picky about how I attach the two ends. (I must confess here that I try to avoid these problems by doing the velcro before putting the headband on my head.) Hopefully Wrapunzel can one day also offer a version of this headband where the ends can be tied and/or adjusted by elastic (so that each individual can still adjust for size/comfort, but no longer have any concerns/worries about the velcro). 2. Sizes and color choices. The white and blonde are not available in the extra small size. (This is a problem with lighter-colored scarves.) Hopefully Wrapunzel will have the extra small available in the other colors for those who use this size. 3. Itchy. I tend to prefer my scarves more forward on my head (think about a finger or two before the start of my hairline), but if I put the headband forward, it can sometimes gets very itchy because it is directly against my skin. (I’ve noticed it does not bother me as much if I put the headband where my hair is.) Hopefully this is only a personal problem of mine and does not affect anyone else. 4. Color bleeding. I found I had to wash the black headband a couple of extra times (to avoid the color bleeding). This really isn’t a problem if you know about it beforehand. Once again, this is a great product that I highly recommend if you want to avoid your scarves slipping! Hi Melissa! Thanks so much for the detailed and honest review! If you have a moment, we’d love to hear from you by email (wrapunzelthestore@gmail.com) – we’d be happy to help troubleshoot the colorfastness and snagging issues! These headbands are amazing! I ordered an XL and was afraid it would be too short because I have a big head (60cm circumference). It actually is a lot stretchier than I expected, maybe I’ll shorten it or try an L with my next order. So don’t be afraid that the headband would be too small. Combined with the Classic Shaper, in my opinion it’s a great solution for big-headed women. What else can I say? You need one of these. Or more than one. Like they said, it’s essential! The velvet headband has made all the difference in making my headscarves an all-day, hassle-free affair. When I’m not wearing a full scarf, I sometimes layer it under other headbands to keep them in place too. I appreciate the stamp on the side that lets you know when it’s on the right way. The velcro started to come loose soon after I ordered it, but I sewed it back on without too much trouble. I am so happy I found these. I recently started covering, and the frustration of constantly retying and worrying that my tichel would slip at inopportune times took a lot of the joy out of it. However, this headband has been wonderful. However, I still find that if I don’t put it low enough down on my forehead, the headband itself will slip off eventually (though not nearly as much as my tichels did without it!!!). My husband prefers I show a small amount of hair and I have a high forehead, so that’s where the problem lies, but I just wanted to let others know that, depending on the shape of your head and where you like to wear your tichels, it might not be a perfect fix. Otherwise, it’s amazing though! If I’m not wearing the ultimate or signature shaper, I am wearing this headband! When I lost my hair to the chemo (non cancer related chemo) I ended up with a bunch of random clearance scarves and longer bandanas before I discovered Wrapunzel. My biggest issue was always keeping the scarves on my head. I didn’t have the hair to hold them in place and I did not have the glory of this headband to hold them in place either. Now I can finally say I do and I couldn’t be happier being able to wear all my non Wrapunzel goodies as well! Essential, unless you are one of those mythical, magical people (I’m sure you exist) who’d scarves never slip. Very good quality compared to other brands. I would however recommend some minor design changes. The rough side of the velcro is a bit long and gets caught on my scarves more often than I would like. If it was bit shorter and the fuzzy side of the velcro a little longer, I think it would get caught less and give me more room for adjustment. After 19+ years of ‘scarf frustration’, I have found a savior… Wrapunzel. Thank you!! Wow. I knew this headband would be awesome. I have been wearing it for just a few hours and it feels so good. It is a new feeling, knowing that my scarf is not going to slip! It is much thinner than I had expected, which really makes it even better. I was bummed that black was out of stock, ended up getting blonde. And I love it! I got the scrunchie as well. It is amazing. Really. No more headaches, no yanking out hair because a messy bun ate two hair elastics. Wrapunzel has beautiful and well priced products and the best customer care. This headband makes a world of difference in staying power. Your scarf *will not* come off or slip or move unless you intend to move it. Love it, along with the oomphtastic scrunchy. Super! I bought the extra large, because I have a large head and a fringe and it is so comfy and grippy! The velcro fastening doesn’t catch on the little hairs at the nape of the neck. I will definitely be back for more! This headband is fantastic, it really works. I have used tube caps under scarves for a while and thought they were good, but this headband doesn’t budge a millimetre. I chose the size based on my measurement minus an inch for negative ease, and I find it a bit tight. The headband has elasticity but is a strong fabric so I find the pull too much. I have fixed this by covering part of the velcro with a scrap of fabric so I can do it up part way without it snagging in my hair. I find that because the velvet is so incredibly grippy, I can wear it quite loosely and it still works perfectly. Next time I order one I’ll get a size bigger. I LOVE my velvet headband. I have very silky hair, and my scarves tend to like to wander. The headband keeps then where they need to be all day, no matter what fabric they are. The next one I order will be a larger size though. The one I got does fit, with minimal stretching, but my head is so sensitive to having any sort of band around it that it still manages to give me headaches…but that’s not the fault of the product! It is a MUST HAVE for covering! Fantastic! This is exactly the right thing. Thanks so much for having the answer to the problem of slippage! I work in a very busy kitchen, and had a hard time keeping my scarves on my head. This headband is amazing! I wear it every day, and love how it stays in place and keeps my scarf in place all day. I am prone to migraines, so I was concerned at first that it might cause me pain, but nope, not even a twinge! I have skipped wearing it once or twice upon waking up with a migraine, but it has never actually *caused* a migraine. I highly recommend it! Before the shapers, this was the one tool that helped me to wear tichels with confidence knowing that the slippage would be minimal, and I was more free to experiment. For a long time, this was all I wore, and a high ponytail and plain tichel tied in a bun was all the volumizer I needed. I would never say that any shaper or volumizer is a must, but for this particular tichel undergarment, I would say this is a necessity. I really love this headband. I have a very large head and found wearing hats hurt. I switch to mostly scarves so I could adjust the size. I bought the biggest size headband and it fit me. I love how simple this is and it keeps my scarves from slipping. I don’t think I would be able to wrap pashminas without this. When I first started wrapping, I used hair clips with cotton scarves and no volume, but even that tended to slide back a bit through the day. I’ve tried the clips since with pashminas and they slide off even before I get them tied. Definitely makes life much easier. I would recommend getting more than one, as it seems to help if you give them a day off between wearings. Kind of like with bras. Also definitely make sure to keep them clean or they won’t work near as well. These work very well ~ and are comfortable ~ my tichel stays put all day! And I am an active person ~ living on a farm you have to know your tichel is going to stay put and not fall off at a bad time! I couldn’t wrap without the velvet headband. Couldn’t. It is completely necessary. I lent mine to a friend (WHY did I only have one?) and ended up wearing hats all week because my tichels would slide around horribly. The velvet band makes wrapping possible. Buy more than one! Trust me on this, you’ll be glad you did! This was probably one of the best purchases I have ever made. The headband is comfortable, and not itchy at all (though my husband says I look like a ninja when I put it on.) it keeps my scarves nicely in place and I do not have to worry about them at all for the rest of the day. I will be purchasing more! Best thing ever since sliced bread! I can wear tichels without them falling off! If you cover…you HAVE to have one of these. And they are not all created equal. I have another brand of velvet headband and it was a waste of money. You can tell this was designed by people who actually use the product. Worth every penny! hi Mikayla! We totally hear you! Like anything, these headbands to wear out… we find they start to lose their punch after 6 months. Butttt a great way to revive them is to wash and dry them on regular setting! Just make sure the velcro doesn’t catch on your clothes! I really like these wig grips and have found them to be of good quality; however, it seems that the longer I have them, the more stretched out they get…it seems like the velcro latch almost passes by where it needs to go. I have a black one and a tan one, but I got both of them in size L/XL because I’m prone to headaches. If anyone knows of a way to “shrink” them back down, that would be great…otherwise I don’t know about ordering a new one that might be too snug in the beginning and then waiting for it to stretch to the right length. As some other ladies have said, buy more than one! You won’t regret it. It really helps to alternate them so they don’t get all stretched out. They do shrink back up with a wash and dry, but if you only have one, you would have to reserve it for a day you aren’t going out, aren’t going to be seen, don’t have social obligations, etc. a rare day indeed! i learned my lesson and bought my second one. you really need to coordinate them to your lights/darks too because my black one stained my pink pashmina. :c but it’s fine, because these and the pashminas are easy and inexpensive to replace. long story short, just get more than one! This item is a true essential. Here is how I use this item, 1) WIGS….I wear wigs and this holds the wig in place, I do wear two hair pins for added security in the back. When you wear this item you wig does NOT Slide at all. 2) Scarves and Turbans… I found out about this site via you tube and I wanted a break from the wigs, I started wearing scarves the “right” way, I ordered this item first and have had success every since. This site is such a blessing and I have ordered several of these headbands. I have washed mine and it was fine. I also made mine bigger before the XL were added to the store by cutting about two inches before the Velcro and sewing in a 2 inch piece of Stretchrite 1 1/2-Inch stretch knit. I am so thankful for this business and the videos on you tube. I will be wearing turbans for LIFE and this page has made a big difference in my success. This headband is a wrapping game-changer definately! Before this baby I made various experiments with underscarfs because my hair is very straight and slippery. I ended up imitating hijabis and used under caps and had to pin my wraps with multiple sewing pins (or straight hijab pins) to keep it sort of in place. With this velvet band I have no need for pinning my wraps exept for very active days or for decorative purposes. Also the XL size fits me well, even though my head is big in circumference: 64 cm. The only downside is that the velcro sticks to my hair in the nape of my neck. I’m thinking about removing the velcro and sewing the band into a fixed size circle. I have been covering for years and the sides of my hair are thin and wispy from the abuse of clips and bobby pins. Figured I had nothing to lose by trying this band. I can’t begin to tell you the difference it makes. Love it!! I’ve recommended it to all my covering friends. Plus… shipping same day? Where does that happen anymore? Thank you for a prompt shipping (non-holiday) and even a phone call to let me know I could have a black one if I wanted it. Fabulous company! This is a must-have products for the simplest to the most complicated looks. It keeps everything in place and the best part is – no headaches! After years struggling with scarves falling off the back of my head and sliding along my slippery hair, this headband solved the problem. No more frustration from scarves sliding back all day, and my entire hair covering experience is a world better. I probably can’t add anything more than what’s already been said about this essential! It is a must have from beginner to expert! I was a little confused at first because I first measured in cm and the description said 48-53 cm for the XL headband which would never have fit my head – but then I measured in inch and got the 22/23 from the description. It turned out that 20-22 inch are really more like 50-55 or even 56 cm. As for the no-slip qualities I still have to try things like running to catch a bus with it, but I already tested it by tying a slippery fake-silk polyester scarf with this headband underneath and then shaking my head, trying to get it off… well, I didn’t get if off. And before, when just wearing such a scarf with a cotton scarf underneath (wearing it on it’s own was impossible) I had to be careful of much gentler movements. I’ve often told people that this no-slip band should be part of their first scarf purchase. I was wearing it once with a very slippery scarf- that I could never have worn without it- and the wind blew my wrap open. But the band kept the scarf on my head and I was able to rewrap it without feeling naked. And it holds up well during simcha dancing (Jewish celebratory dancing, which tends to be very lively). I normally tie my tichel 2-3 inches behind my hair line, and this headband is such a life-saver! The size I ordered ended up being smaller than what I needed, but it still works very well. My scarves don’t budge, and the headband has enough give to prevent headaches. The headband doesn’t slide at all, and it’s very comfortable. I plan to order the next size up as soon as I can just so the velcro doesn’t get stuck in my hair. Great product! This no-slip headband cannot be compared. It is simply amazing. It holds perfectly! I have gotten on roller coasters and my tichel never moved. Amazing! A must have. Thank you so very much. I ordered 2 headbands and boy, am I glad I did. They are WONDERFUL! To add to my experience the order arrived in great time. Just ordered more “goodies” from Wrapunzel. Ladies, this is a great service you’re offering. Thank you once again. I’m so glad I ordered 2 No-slip headbands, I can’t find anything remotely like them here in rural southern Illinois(even at the local wig boutique) and they are the only reason that I can successfully and tastefully cover my hair. Thank you, Wrapunzel Ladies, for providing these for sale on your website for such a reasonable price. Was so relieved that it REALLY works! My scarves stay on all day without coming off or even slipping without wrapping them tightly. Worth much more than price. I just recieved this in the mail today, and oh my, what a amazing thing it is. I wanted to cover my head as a spiritual discipline for advent. Mostly in preparation I’ve been wearing headbands, becase I could not get a scarf to stay on my head. Now I will be able to fully cover for advent and not worry about my cover as I go through my crazy day as a busy mommy. I could not believe when I tied a silk scarf around my head, how secure it was. This discovery is such a gift. Thank you! A friend gave me the velvet band as a gift, and I was skeptical about it at first…. Until I wore it the next day and my head covering didn’t budge the entire day, even with my giant bun at the back and with toddlers yanking on it! This is a must have for anyone who wears head coverings. I can’t imagine every day life without it! So amazing! So snug! I was suddenly aware of how much time I spent readjusting my scarf, because I kept reaching up to fix it and realizing I didn’t have to! It makes me feel comfortable and capable. Thank you! Excellent, excellent, excellent, Masha’Allah! I am a hijabi Muslim woman who wears both tichel-turbans and more islamic-style headscarves. Wrapunzel’s velvet headband is leagues above a different make of velvet headband (from a different merchant) that kept folding up on itself. This baby works like double-sided duct tape to keep whatever you put on your head (tichels, scarves, tube undercaps, etc.) actually ON your head without sliding around. And once you get the hang of fastening it NOT TOO SNUG, it is super comfortable (unlike the duct tape). Tip: in addition to orienting the nap of the velvet towards your face, also take the time to point the rough part of the velcro towards your scalp so that (if exposed) it cannot rough up your scarf. So nice not having to worry about slippage! Deffinatly a MUST! 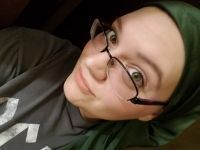 The quality of these headbands is beyond what you can find in most places– my sister-in-law has some from Israel that work ok, but Wrapunzel’s are hemmed and a tiny bit thicker and so really help to keep everything in place. This headband is fantastic! It holds my tichels in place perfectly, and is easy to adjust. The only word of caution I would have is that the size is not very big. If you have an average head or smaller than average, it should work great. However if you have a slightly larger sized head, this would definitely be too small. This is the foundation step you don’t want to miss! It’s the “bra and underpants” of tichel tying, LOL. These are especially helpful if you are running around chasing small children all day. Your scarf won’t budge an inch, and it holds all the stray baby hairs back, too. LOVE THIS! 100% wonderful. Keeps everything extremely secure (I’m totally impressed!). Love it, love it, love it! I began wrapping in the Wrapunzel style before purchasing this headband, and sometimes the style would work, sometimes not. But now that I have the headband…what a WORLD of difference it makes! The styles work, and my tichels are more comfortable because I can tie the scarves more loosely. I also don’t have to worry about my very grabby 8-month-old pulling my headscarf off. The (in my case) $11 was so worth it. I bought one not so long ago, and it just change my tichel wearing because for years, I get used to tie my tichels quite strong so they won’t slip. But now, with this, I can tie them less, bye bye headeaches!!! Thanks for selling them! I have both the black and beige headbands. They are a total life saver. My tichels stay in place all day. I’m not sure what I’d do without them. They are soft. And to wear a tichel you have to have one. They adjust really easy. I wash my in the sink and hang dry. I bought XL and fits perfectly. Thank you Andrea and Rivka Malka for having these. I love them and yall. I have owned 5 grippers, and there are none other that can compare to this one. It is perfect. It simply will not allow your scarf to budge. I want to point out that the comfort level is extraordinary, I don’t notice I’m wearing it. It lays so flat. I am buying a couple more just to have. Excellent! Absolutely a must have! I really don’t know how I managed before. Ok, I have fallen asleep in a wrap while wearing one of these underneath- and even with my preschooler napping ON my head, the. scarf. did. not. budge. =) I suggest pinching the edge of the scarf tightly and pulling slowly when removing if it gets caught in the velcro. The first no slip headband I bought, I got from another website before I fund wrapunzel. It was cheap, and I didn’t know the difference, so I bought it. IT ended up having velvet on only one side, so while my scarves didn’t slip, the headband slipped and pulled on my hair. As I have stated in various other reviews, I tend to get headaches from wrapping, so this was not working for me. I decided to buy the no slip headband from Wrapunzel, which is double sided (velvet on both sides) and it changed everything. Now neither my scarf nor the headband itself slips. IT makes a huge difference. I was having to retie multiple times just to keep my headband from slipping, and I had started using bobby pins. Now I can leave it in all day and don’t have to worry about pinning it. A practical note: I have a very small head when it comes to hats. If I were to buy a regular hat, I would probably buy a child size. But, because of the shape of my head and the angle on which the headband sits, I ended up needing a much larger size than I had originally assumed (Luckily, I had already made that mistake with the first headband I bought, so I knew better when buying this one.) Be sure to measure your head before you buy a headband and trust the numbers. I can’t stress this enough. Andrea and Rivka Malka have generously put the measurements up along with the sizes, so use that information and trust what your tape measure tells you, even if it goes against everything you think you know about your head. I love my black no slip headband. I actually just ordered another one in tan for my lighter colored tichels. The only problem I have is that the velcro sometimes gets stuck on my 2 & 1. Slumping/falling tichels were a daily occurrence for me until I purchased this little miracle! It does precisely what it says it does…my tichels now never slip or budge! Also, very comfy, no headaches or soreness from wearing this the entire day long. Thank you so much for making this headband available! I already own three other brands of velvet headbands so I was hesitant to buy another. This one is so much better! It lays flat, is wide enough for a tichel shaper and scarf, and there is really no slipping! I always thought that maybe I was doing something wrong with my other headbands because I always had some minor slipping and needed to readjust in the middle of the day. This one is just a much better product, thank you Wrapunzel! I have a very large head, so all normal headbands never fit (the make a slow crawl to the back of my head before sliding off completely, or in some amusing cases, popping off like a spring). This stays on like magic and keeps my scarves on amazingly too, even when in the presence of a two year old! The only thing that I would possibly mention in instructions of use is to watch out where the “scratchy” side of the velcro is placed. If you have it up when attaching and leave some of it exposed, it will snag your scarf (and you will be sad). Make sure the scratchy velcro is facing down, towards your head when you fasten, with the soft side up, it helps to avoid snagging. An absolute must! You never know how much you love it and need it until you don’t have it. I was getting dressed Sunday morning and I was putting on my tichels last. I reached for my head-band, but it was not in the usual place. I freaked out big time. I was almost in tears. I had such beautiful tichels picked out to wear. I was already running late for worship, so I had to go with a hat instead. So my advise is to buy two! If you don’t have a no-slip headband yet, it is the first thing to put in your cart. Without something similar, even the simplest scarf will slip and slide on your head as you move. With these, your tichels will always stay in place–even if they are heavy multi-wrap styles. Can’t wait to see them in lighter colors! This is the best purchase I have ever made!!! These headbands keep your tichel in place so well, that I am able to belly dance and my cover never moves!! I can’t live without my headbands!! SO NECESSARY! I feel like I need a ton more, even though I have two already! Once you run them through a little water and hang them to dry, they are a perfect size (or at least they were for my head), and they keep everything from slipping – and therefore you don’t have to tie as tight! I honestly don’t know how I was able to keep any of my covers on my head before this product. Andrea told me about it in one of our many talks (not sure if it was in a FB group or private chat or what) so I finally took that leap and got one. I doubted seriously that I would see a big difference… boy was I in for a surprise!! This headband is like a combination of “spanks for your headcover” and “duct tape for your wrap” in that it not only provides a smooth and secure place to start your wraps, but it also keeps your wrap firmly in place…. WITHOUT giving headaches (which I am prone to). I cannot say enough how wonderful this product is. Thank you thank you thank you, Andrea, for convincing me to get one. And thanks for the low prices too… I need to get a second one, I’m thinking, since I have a crazy idea I want to try out. Heehee that is awesome! Yeah when I (Andrea) wore it the first time I was also wearing it the wrong way! Glad you’re loving it and it’s working well for you! I wasn’t always a tichel wearer and today I don’t really wear tichels out of the house. That being said I primarily wear wigs. I love my wigs I feel beautiful and comfortable. But I hate the combs. I feel like if I don’t use ALL the combs that it will fall right off but that by using the combs pretty soon I’m going to have bald patches!!! So thanx to the no-slip headband not only do my tichels stay on but so do my wigs, comb free :-). On a side note I wasn’t always happy with this brand I thought it didn’t work as well as others, silly me I was wearing it the wrong way. This headband is a lifesaver! I used to have redo or seriously adjust my scarf once or twice throughout the day, I don’t even know how I functioned without one of these. The headband is never too tight, and it feels very secure. This headband is the duct tape of head coverings! The super glue that keeps things looking nice, and not sliding off the back of your head. I have had this one since the start of January, and after these months it still looks and wears like it did new! This is ABSOLUTELY essential!! I love it! It’s soft and durable and I can wear it all day long with zero problems!! I just got my no-slip headband today & I already know I love it! I wear a wig & headscarves due to hair loss & even with clips my wigs slip – not to mention how uncomfortable those clips! I learned to wrap & tie my scarves through Rivka’s tutorials, which led me to Wrapunzel & the no-slip headband. I am so excited! No more pain from clips pulling out what little hair I have left! I just got out of the hospital where I wore a headscarf the whole time. I just wish I had the headband then! I know I will recommend your store to my friends! Love the No-Slip Headband! It’s a must have for anyone that wears a tichel. I have to move around a lot at work and my tichel doesn’t move! Thanks Andrea and Rivka. I measured my head with a cloth tape measure. It came out at 22 inches, so I ordered the large. Well, the large is too large even at its smallest. 😛 So I’m ordering a second in a medium size. Otherwise, the headband works beautifully on my slippery hair. Usually anything on my head slides right off, but the headband kept everything nice and secure. Even the weight of my ponytail couldn’t dislodge it. This is a MUST have for any tichel wearer! I have used clips and bobby pins and my tichels would STILL slip. I will NEVER go without one of these again! If you are reading this review just stop scroll up and add 1 or more to your cart, you WON’T be sorry!! Thank you so much Andrea and Rivka! Could anyone please tell me the length of the no-slip-headband? How many inches is it? I don’t want end up buying something I cannot wear and cannot return. Not sure how I managed scarves before this headband! It’s grippy enough that I can wear even complicated styles without fussing or tugging the scarves down throughout the day. It is on the smaller side (I only attach a bit of the Velcro to itself), but as it stretches over time – I’m imagining that I’ll get more use out of it. This is really useful and well made. The XL is large enough for me (I have to wear large hats), which is wonderful. Amaaaaaaaaaaazing! Total game-changer! With my headband on , my tichels will not budge…even back-weighted styles like a double braid or twist stay put all day. 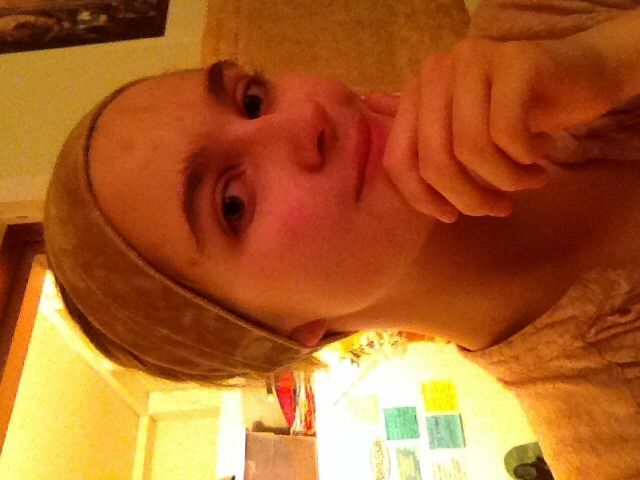 I won’t even think about my tichel without wearing my no-slip headband. I have experimented with tichels a lot during my conversion process (Reform Jewish), as I always cover my hair while praying. I always quite liked them, but never was satisfied, because they would always slide back on my head. If only I’d known. This headband is everything they say above – wide, flat, and “toothy” enough to really hold what you put on top of it. The only reason this isn’t a 5 is the velcro. It has caught the edge of some tichels a bit, making me concerned they might be damaged. Hopefully as improve, I’ll learn how to protect them from the velcro. We searched high and low for these – the scrunchy of all scrunchies! Don’t be fooled by the photo… these babies are huge! Using a scrunchy instead of a hair elastic takes the tension off your head and saves your hair! The velvet makes it slip-proof, so you don’t have to tie it back too tightly. Since these scrunchies are extra large, they also add extra “oomph” to your tichel, especially when paired with a shaper. Perfect! This one has been a long time coming! Time and time again we have been asked about the possibility of providing a shaper option that has a velvet headband sewed in. And up until now, all the designs that we tried simply weren’t up to our Wrapunzel standards. But… the wait is over! We now have a signature shaper that has THE Wrapunzel no-slip headband sewn in! It’s so soft, and the grip is unbelievable! The “pouf” part provides the perfect amount of oomph for a natural look, and it’s just oh so comfortable. Good things come to those who wait! Super soft and light fabric! The grippiest no-slip headband that won’t wear out! Adjustable sizing! Super affordable too! The perfect “under-tichel-garment” to give you the ultimate shape and security! Check out this video for the story behind it and wearing instructions! The Original Wrapunzel Classic Shaper is BACK! And it is new and improved! Better design, higher quality material – we are so proud and excited to bring these back! Please note that these shapers, unlike other Wrapunzel shapers, must be worn with a no-slip headband. This shaper has a larger ‘pouf’ than the Wrapunzel Signature Shaper for a more dramatic look. See the graphic in our gallery for a comparison of all the Wrapunzel Shapers. We originally designed the Classic Shaper to work with our No-Slip Headbands for ladies that love a full-volume look with their head wraps. Then, we wanted to go further – so along came the Signature Shaper. The Signature Shaper combined a shaper and high-quality no-slip headband in one elegant package, with a smaller, more natural-looking ‘pouf.’ But we wanted the ULTIMATE solution – an all in one-shaper that had everything that you were asking for! We worked with our seamstresses, and together we designed the Wrapunzel Ultimate Shaper! ‘Pouf’ size is adjustable! Add extra stuffing for bigger volume or remove some stuffing for a smaller, more natural-looking shape. Cotton jersey fabric is thick enough for durability but thin and soft enough for all-day comfort. We can’t wait for you to try one for yourself! Enjoy the Ultimate shaper experience. Our shapers, including the Wrapunzel Signature Shaper, Ultimate Shaper, Cloud9 Shaper, and Wendy Beret Volumizer are famous for their adjustability – you can remove as much stuffing as you want in order to get just the look you desire! But what about if you want to ADD even more stuffing, or replace stuffing on a shaper that’s seen years of wear? Enter the Extra Shaper Stuffing bag!